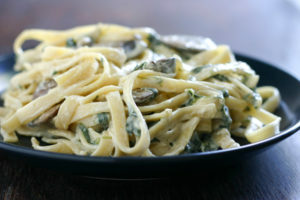 Home » dinner » ALFREDO PLEASE! Even though I’m happily married to a nice Jewish boy there is this guy, Alfredo, who is kinda special to me and we have a “date night” every few weeks. Before you ask, the answer is yes; my husband does know about our relationship and is actually ok with it. In fact, he encourages us to get together with him as often as I like. Our getting together is often accompanied by wine and the chance to sit and linger over a meal and quite frankly, anyone who doesn’t have an Alfredo in their life is really missing out a really special sauce. 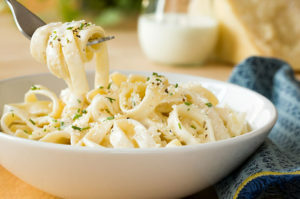 To make Alfredo sauce, you first melt butter in a pan and then add in cheese (usually parmesan) and then you add the cream. Once the cheese is melted, you can add salt, pepper, or whatever other seasonings you want. You can also add or substitute Romano, Asiago, or other cheeses but you should know it does change the flavor of the sauce somewhat. After combining the sauce with your fettuccine noodles (or whatever other noodle you choose) you can add salmon, mock crab, vegetables, or mushrooms on top of the dish if you want to use it as an entrée instead of a side dish. The only downside to the sauce seems to be its rather high calorie count and the astronomical amount of cholesterol. That small matter aside, it’s all good. While most Alfredo sauce recipes are pretty much the same they can, with the addition of a few nontraditional ingredients, become something truly outstanding. In my mind Alfredo sauce is the piece of romance for date night. The only question is does he have a brother? In a large sauce pan sauté the garlic in the olive oil for about 2 minutes, making sure not to let the garlic get too dark. Add the parmesan, cream cheese, butter, cream and milk to the skillet, cook, whisking constantly until the mixture is smooth. Add the spinach, mix to combine. If the sauce is too thick, you may want to add a little more cream. Pour the sauce over the cooked pasta and toss to coat and serve. Serves 4. This recipe can be doubled or tripled. In a small saucepan over low heat melt butter. Whisk in the flour. Cook, stirring constantly for 2 minutes. Add the broth and milk and whisk to combine. Add garlic, salt and pepper and whisk to combine. Continue to cook over low heat, stirring constantly until the sauce thickens. Add the salmon and cook for 2 minutes, stirring constantly so the sauce won’t burn or stick. Add the cheese, cook for 1 to 2 minutes and serve over the cooked pasta. Serves 4. In a saucepan heat the milk and garlic to a simmer and add the cheeses and nutmeg and stir and cook until the cheese is until melted and the sauce is thickened. If the sauce it too thick add a little skim milk and whisk to combine. Add the pepper, stir and serve over pasta. Serves 4. ← PUMPKIN SOUP INSTEAD OF PUMPKIN PIE????? ?